Antonov Lyudmil, Lyudmil Antonov. 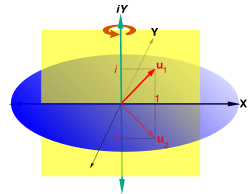 Eigenvalue, eigenvector and eigenspace [Internet]. Version 2. Lyudmil Antonov. 2011 Nov 29. Available from: https://lantonov.wordpress.com/article/eigenvalue-eigenvector-and-eigenspace-1bjs24sr0a59u-2/. In mathematics, a vector may be thought of as an arrow. It has a length, called its magnitude, and it points in some particular direction. A linear transformation may be considered to operate on a vector to change it, usually changing both its magnitude and its direction. An eigenvector of a given linear transformation is a non-zero vector which is multiplied by a constant called the eigenvalue (info) as a result of that transformation. The direction of the eigenvector is either unchanged by that transformation (for positive eigenvalues) or reversed (for negative eigenvalues). In mathematics, a vector may be thought of as an arrow. It has a length, called its magnitude, and it points in some particular direction. A linear transformation may be considered to operate on a vector to change it, usually changing both its magnitude and its direction. An eigenvector of a given linear transformation is a non-zero vector which is multiplied by a constant called the eigenvalue as a result of that transformation. The direction of the eigenvector is either unchanged by that transformation (for positive eigenvalues) or reversed (for negative eigenvalues). For example, an eigenvalue of +2 means that the eigenvector is doubled in length and points in the same direction. An eigenvalue of +1 means that the eigenvector is unchanged, while an eigenvalue of −1 means that the eigenvector is reversed in direction. An eigenspace of a given transformation is the span of the eigenvectors of that transformation with the same eigenvalue, together with the zero vector (which has no direction). An eigenspace is an example of a subspace of a vector space. In linear algebra, every linear transformation between finite-dimensional vector spaces can be given by a matrix, which is a rectangular array of numbers arranged in rows and columns. Standard methods for finding eigenvalues, eigenvectors, and eigenspaces of a given matrix are discussed below. These concepts play a major role in several branches of both pure and applied mathematics — appearing prominently in linear algebra, functional analysis, and to a lesser extent in nonlinear mathematics. Many kinds of mathematical objects can be treated as vectors: functions, harmonic modes, quantum states, and frequencies, for example. In these cases, the concept of direction loses its ordinary meaning, and is given an abstract definition. Even so, if this abstract direction is unchanged by a given linear transformation, the prefix “eigen” is used, as in eigenfunction, eigenmode, eigenstate, and eigenfrequency. where x and y are any two vectors of the vector space L and α is any scalar. Such a function is variously called a linear transformation, linear operator, or linear endomorphism on the space L.
Given a linear transformation A, a non-zero vector x is defined to be an eigenvector of the transformation if it satisfies the eigenvalue equation Ax = λx for some scalar λ. In this situation, the scalar λ is called an eigenvalue of A corresponding to the eigenvector x. The key equation in this definition is the eigenvalue equation, Ax = λx. Most vectors x will not satisfy such an equation. A typical vector x changes direction when acted on by A, so that Ax is not a multiple of x. This means that only certain special vectors x are eigenvectors, and only certain special numbers λ are eigenvalues. Of course, if A is a multiple of the identity matrix, then no vector changes direction, and all non-zero vectors are eigenvectors. But in the usual case, eigenvectors are few and far between. They are the “normal modes” of the system, and they act independently. The requirement that the eigenvector be non-zero is imposed because the equation A0 = λ0 holds for every A and every λ. Since the equation is always trivially true, it is not an interesting case. In contrast, an eigenvalue can be zero in a nontrivial way. An eigenvalue can be, and often is, a complex number. In the definition given above, eigenvectors and eigenvalues do not occur independently. Instead, each eigenvector is associated with a specific eigenvalue. For this reason, an eigenvector x and a corresponding eigenvalue λ are often referred to as an eigenpair. One eigenvalue can be associated with several or even with infinite number of eigenvectors. But conversely, if an eigenvector is given, the associated eigenvalue for this eigenvector is unique. Indeed, from the equality Ax = λx = λ’x and from x ≠ 0 it follows that λ = λ’. Fig. 2. The eigenvalue equation as a homothety (similarity transformation) on the vector x.
Geometrically (Fig. 2), the eigenvalue equation means that under the transformation A eigenvectors experience only changes in magnitude and sign — the direction of Ax is the same as that of x. This type of linear transformation is defined as homothety (dilatation, similarity transformation). The eigenvalue λ is simply the amount of “stretch” or “shrink” to which a vector is subjected when transformed by A. If λ = 1, the vector remains unchanged (unaffected by the transformation). A transformation I under which a vector x remains unchanged, Ix = x, is defined as identity transformation. If λ = –1, the vector flips to the opposite direction (rotates to 180°); this is defined as reflection. If x is an eigenvector of the linear transformation A with eigenvalue λ, then any vector y = αx is also an eigenvector of A with the same eigenvalue. From the homogeneity of the transformation A it follows that Ay = α(Ax) = α(λx) = λ(αx) = λy. Similarly, using the additivity property of the linear transformation, it can be shown that any linear combination of eigenvectors with eigenvalue λ has the same eigenvalue λ. Therefore, any non-zero vector in the line through x and the zero vector is an eigenvector with the same eigenvalue as x. Together with the zero vector, those eigenvectors form a subspace of the vector space called an eigenspace. The eigenvectors corresponding to different eigenvalues are linearly independent meaning, in particular, that in an n-dimensional space the linear transformation A cannot have more than n eigenvectors with different eigenvalues. The vectors of the eigenspace generate a linear subspace of Ln which is invariant (unchanged) under this transformation. where the juxtaposition of matrices means matrix multiplication. This is equivalent to a set of n linear equations, where n is the number of basis vectors in the basis set. In these equations both the eigenvalue λ and the components of x are unknown variables. The eigenvectors of A as defined above are also called right eigenvectors because they are column vectors that stand on the right side of the matrix A in the eigenvalue equation. If there exists a transposed matrix AT that satifies the eigenvalue equation, that is, if ATx = λx, then λxT = (λx)T = (ATx)T = xTA, or xTA = λxT. The last equation is similar to the eigenvalue equation but instead of the column vector x it contains its transposed vector, the row vector xT, which stands on the left side of the matrix A. The eigenvectors that satisfy the eigenvalue equation xTA = λxT are called left eigenvectors. They are row vectors. In many common applications, only right eigenvectors need to be considered. Hence the unqualified term “eigenvector” can be understood to refer to a right eigenvector. Eigenvalue equations, written in terms of right or left eigenvectors (Ax = λx and xTA = λxT) have the same eigenvalue λ. An eigenvector is defined to be a principal or dominant eigenvector if it corresponds to the eigenvalue of largest magnitude (for real numbers, largest absolute value). Repeated application of a linear transformation to an arbitrary vector results in a vector proportional (collinear) to the principal eigenvector. The eigenvalue of smallest magnitude of a matrix is the same as the inverse (reciprocal) of the dominant eigenvalue of the inverse of the matrix. Since most applications of eigenvalues need the eigenvalue of smallest magnitude, the inverse matrix is often solved for its dominant eigenvalue. The applicability of the eigenvalue equation to general matrix theory extends the use of eigenvectors and eigenvalues to all matrices, and thus greatly extends the scope of use of these mathematical constructs not only to transformations in linear vector spaces but to all fields of science that use matrices: linear equations systems, optimization, vector and tensor calculus, all fields of physics that use matrix quantities, particularly quantum physics, relativity, and electrodynamics, as well as many engineering applications. The determination of the eigenvalues and eigenvectors is important in virtually all areas of physics and many engineering problems, such as stress calculations, stability analysis, oscillations of vibrating systems, etc. It is equivalent to matrix diagonalization, and is the first step of orthogonalization, finding of invariants, optimization (minimization or maximization), analysis of linear systems, and many other common applications. For real matrices, the coefficients of the characteristic polynomial are all real. The number and type of roots depend on the value of the discriminant, D. For cases D = 0, D > 0, or D < 0, respectively, the roots are one real, two real, or two complex. If the roots are complex, they are also complex conjugates of each other. When the number of roots is less than the degree of the characteristic polynomial (the latter is also the number of dimensions of the vector space) the equation has a multiple root. In the case of a quadratic equation with one root, this root is a double root, or a root with multiplicity 2. A root with a multiplicity of 1 is a simple root. A quadratic equation with two real or complex roots has only simple roots. In general, the algebraic multiplicity of an eigenvalue is defined as the multiplicity of the corresponding root of the characteristic polynomial. The sum of the algebraic multiplicities of all eigenvalues of the transformation is equal to the dimension of the linear vector space. The spectrum of a transformation on a finite dimensional vector space is defined as the set of all its eigenvalues. In the infinite-dimensional case, the concept of spectrum is more subtle and depends on the topology of the vector space. where S0 = 1, S1 = tr(A), the trace of the transformation matrix A, and Sk with k > 1 are the sums of the principal minors of order k; Sk are the elementary symmetric functions. The fact that eigenvalues are roots of an n-order equation shows that a linear transformation of an n-dimensional linear space has at most n different eigenvalues. According to the fundamental theorem of algebra, in a complex linear space, the characteristic polynomial has at least one zero. Consequently, every linear transformation of a complex linear space has at least one eigenvalue. For real linear spaces, if the dimension is an odd number, the linear transformation has at least one eigenvalue; if the dimension is an even number, the number of eigenvalues depends on the determinant of the transformation matrix: if the determinant is negative, there exists at least one positive and one negative eigenvalue, if the determinant is positive nothing can be said about existence of eigenvalues. The complexity of the problem for finding roots/eigenvalues of the characteristic polynomial increases rapidly with increasing the degree of the polynomial (the dimension of the vector space), n. Thus, for n = 3, eigenvalues are roots of the cubic equation, for n = 4 — roots of the quartic equation. For n > 4 there are no exact solutions and one has to resort to root-finding algorithms, such as Newton’s method (Horner’s method) to find numerical approximations of eigenvalues. For large symmetric sparse matrices, Lanczos algorithm is used to compute eigenvalues and eigenvectors. The equations are solved for x and y by the usual algebraic or matrix methods. Often, it is possible to divide both sides of the equations to one or more of the coefficients which makes some of the coefficients in front of the unknowns equal to 1. This is called normalization of the vectors, and corresponds to choosing one of the eigenvectors (the normalized eigenvector) as a representative of all vectors in the eigenspace corresponding to the respective eigenvalue. The x and y thus found are the components of the eigenvector in the coordinate system used (most often Cartesian, or polar). Using the Cayley-Hamilton theorem which states that every square matrix satisfies its own characteristic equation, it can be shown that (most generally, in the complex space) there exists at least one non-zero vector that satisfies the eigenvalue equation for that matrix. As it was said in the Definitions section, to each eigenvalue correspond an infinite number of colinear (linearly dependent) eigenvectors that form the eigenspace for this eigenvalue. On the other hand, the dimension of the eigenspace is equal to the number of the linearly independent eigenvectors that it contains. The geometric multiplicity of an eigenvalue is defined as the dimension of the associated eigenspace. A multiple eigenvalue may give rise to a single eigenvector so that its algebraic multiplicity may be different than the geometric multiplicity. However, as already stated, different eigenvalues are paired with linearly independent eigenvectors. From the aforementioned, it follows that the geometric multiplicity cannot be greater than the algebraic multiplicity. The examples that follow are for the simplest case of 2×2 real matrices, representing transformations in the plane (i.e. two-dimensional real Euclidean vector space). It is worth noting that some real 2×2 matrices do not have any real eigenvalues, and thus no real eigenvectors (e.g. a matrix representing a rotation of 45 degrees will not leave any non-zero vector pointing in the the same direction.) Nevertheless, all those matrices also represent tranformations of the two dimensional complex Euclidean vector space, and do have complex eigenvectors and eigenvalues. In general, transformations on an n-dimensional complex vector space can be thought of as acting on a real vector space of dimension 2n. Fig. 3. When a surface is stretching equally in homothety, any one of the radial vectors can be the eigenvector. which, expressed in words, means that the transformation is equivalent to multiplying the length of the vector by λ while preserving its original direction. The equation thus obtained is exactly the eigenvalue equation. Since the vector taken was arbitrary, in homothety any vector in the vector space undergoes the eigenvalue equation, i. e. any vector lying on the balloon surface can be an eigenvector. Whether the transformation is stretching (elongation, extension, inflation), or shrinking (compression, deflation) depends on the scaling factor: if λ > 1, it is stretching, if λ < 1, it is shrinking. Several other transformations can be considered special types of homothety with some fixed, constant value of λ: in identity which leaves vectors unchanged, λ = 1; in reflection about a point which preserves length and direction of vectors but changes their orientation to the opposite one, λ = −1; and in null transformation which transforms each vector to the zero vector, λ = 0. The null transformation does not give rise to an eigenvector since the zero vector cannot be an eigenvector but it has eigenspace since eigenspace contains also the zero vector by definition. Fig. 4. Vertical shrink (k2 < 1) and horizontal stretch (k1 > 1) of a unit square. Eigenvectors are u1 and u2 and eigenvalues are λ1 = k1 and λ2 = k2. This transformation orients all vectors towards the principal eigenvector u1. Dividing the last equation by k2 − k1, one obtains y = 0 which represents the x axis. A vector with length 1 taken along this axis represents the normalized eigenvector corresponding to the eigenvalue λ1. The eigenvector corresponding to λ2 which is a unit vector along the y axis is found in a similar way. In this case, both eigenvalues are simple (with algebraic and geometric multiplicities equal to 1). Depending on the values of λ1 and λ2, there are several notable special cases. In particular, if λ1 > 1, and λ2 = 1, the transformation is a stretch in the direction of axis x. If λ2 = 0, and λ1 = 1, the transformation is a projection of the surface L2 on the axis x because all vectors in the direction of y become zero vectors. Let the rubber sheet is stretched along the x axis (k1 > 1) and simultaneously shrunk along the y axis (k2 < 1) as in Fig. 4. Then λ1 = k1 will be the principal eigenvalue. Repeatedly applying this transformation of stretching/shrinking many times to the rubber sheet will turn the latter more and more similar to a rubber string. 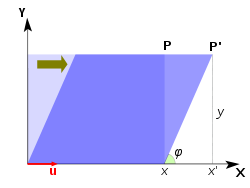 Any vector on the surface of the rubber sheet will be oriented closer and closer to the direction of the x axis (the direction of stretching), that is, it will become collinear with the principal eigenvector. The last equation is divided by k (normalization) to obtain y = 0 which is a straight line along the x axis. This line represents the one-dimensional eigenspace. In the case of shear the algebraic multiplicity of the eigenvalue (2) is greater than its geometric multiplicity (1, the dimension of the eigenspace). 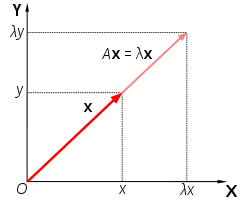 The eigenvector is a unit vector along the x axis. The case of vertical shear with transformation matrix is dealt with in a similar way; the eigenvector in vertical shear is along the y axis. 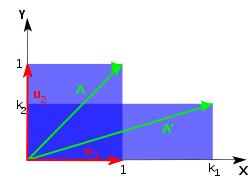 Applying repeatedly the shear transformation changes the direction of any vector in the plane closer and closer to the direction of the eigenvector. For more details on this topic, see Rotation matrix. Fig. 6. 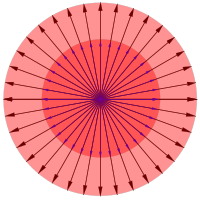 Rotation in a plane. The rotation plane is horizontal and the rotation is in the counterclockwise direction. The real axes X and Y lie on the rotation plane. The complex plane, determined by the real axis X and the complex axis iY is vertical and intersects the plane of rotation in the X axis. The complex eigenvectors u1 = 1 + i and u2 = 1 − i are radius vectors of the complex conjugated eigenvalues and lie in the complex plane. which, divided by sin φ and rearranged, gives the equation y = − i x. When the second eigenvalue, λ2, is plugged in the eigenvalue equation, one obtains y = i x. Geometrically, these solutions represent straight lines in the complex plane XiY that cross the origin and are inclined towards the coordinate axes at angles of 45°; y = − i x lies in the second and fourth quadrant and y = i x lies in the first and the third quadrant. Unit vectors, taken at the directions of these lines are the two eigenvectors, u1 and u2 (Fig. 6). Those eigenvectors are orthogonal (at angle 90°) to each other. However, as said above, in rotation one cannot speak about an eigenvector in the usual sense since all vectors change directions and there is no one-dimensional eigenspace (straight line) invariant under rotation. In general, when the eigenvalue is a complex conjugate scalar, the two complex vectors form a single two-dimensional eigenspace (the complex plane; the vertical plane on Fig. 6) that is shared between the two eigenvalues so that those preserve their geometric multiplicities equal to 1.
which is the same as the reflection matrix (homothety with λ = −1). where α is the respective Euler angle (the yaw angle). The characteristic equation of this transformation can be factored to become (λ − 1)(λ2 − 2λ cos α + 1) = 0. The parentheses contain two equations whose solutions form the set of eigenvalues. The roots of λ2 − 2λ cos α + 1 = 0, are, as already shown above, λ1,2 = cos α ± i sin α = e ± iα. The solution of λ − 1 = 0 is λ3 = 1. The eigenspace of λ1,2 is a complex plane through axis Y, while the eigenspace of λ3 is axis Z. The eigenvector for λ3 is an arrow with length 1 along the Earth’s spin axis pointing towards the North Pole. This is a good example of what was stated above: if the dimension is an odd number (L3), the linear transformation has at least one real eigenvalue (λ3 = 1); if the dimension is an even number (L2), the number of eigenvalues depends on the determinant of the transformation matrix: if the determinant is negative (improper rotation: determinant is equal to − 1), there exists at least one positive and one negative real eigenvalue, if the determinant is positive (proper rotation: determinant is equal to 1) nothing can be said about existence of real eigenvalues. As described above for proper rotation, eigenvalues are real only in certain special cases (φ = 180° × k), and they are complex in all other cases. This is reflected by the fact that axis X is the only geometric site of points, common to the real and complex planes. Korn, Granino A.; Korn, Theresa M. (2000), Mathematical Handbook for Scientists and Engineers: Definitions, Theorems, and Formulas for Reference and Review, 1152 p., Dover Publications, 2 Revised edition, ISBN 0-486-41147-8 . Lipschutz, Seymour (1991), Schaum’s outline of theory and problems of linear algebra, Schaum’s outline series (2nd ed. ), New York, NY: McGraw-Hill Companies, ISBN 0-07-038007-4 . Friedberg, Stephen H.; Insel, Arnold J.; Spence, Lawrence E. (1989), Linear algebra (2nd ed. ), Englewood Cliffs, NJ 07632: Prentice Hall, ISBN 0-13-537102-3 . Strang, Gilbert (1993), Introduction to linear algebra, Wellesley-Cambridge Press, Wellesley, MA, ISBN 0-961-40885-5 . Strang, Gilbert (2006), Linear algebra and its applications, Thomson, Brooks/Cole, Belmont, CA, ISBN 0-030-10567-6 . Bowen, Ray M.; Wang, Chao-Cheng (1980), Linear and multilinear algebra, Plenum Press, New York, NY, ISBN 0-306-37508-7 . Cohen-Tannoudji, Claude (1977), “Chapter II. The mathematical tools of quantum mechanics”, Quantum mechanics, John Wiley & Sons, ISBN 0-471-16432-1 . Fraleigh, John B.; Beauregard, Raymond A. (1995), Linear algebra (3rd ed. ), Addison-Wesley Publishing Company, ISBN 0-201-83999-7 (international edition) . Golub, Gene H.; van Loan, Charles F. (1996), Matrix computations (3rd Edition), Johns Hopkins University Press, Baltimore, MD, ISBN 978-0-8018-5414-9 . Hawkins, T. (1975), “Cauchy and the spectral theory of matrices”, Historia Mathematica 2: 1-29 . Horn, Roger A.; Johnson, Charles F. (1985), Matrix analysis, Cambridge University Press, ISBN 0-521-30586-1 (hardback), ISBN 0-521-38632-2 (paperback) . Kline, Morris (1972), Mathematical thought from ancient to modern times, Oxford University Press, ISBN 0-195-01496-0 . Meyer, Carl D. (2000), Matrix analysis and applied linear algebra, Society for Industrial and Applied Mathematics (SIAM), Philadelphia, ISBN 978-0-89871-454-8 . Brown, Maureen (October 2004), Illuminating Patterns of Perception: An Overview of Q Methodology . Golub, Gene F.; van der Vorst, Henk A. (2000), “Eigenvalue computation in the 20th century”, Journal of Computational and Applied Mathematics 123: 35-65 . Akivis, Max A.; Vladislav V. Goldberg (1969), Tensor calculus, Russian, Science Publishers, Moscow . Gelfand, I. M. (1971), Lecture notes in linear algebra, Russian, Science Publishers, Moscow . Alexandrov, Pavel S. (1968), Lecture notes in analytical geometry, Russian, Science Publishers, Moscow . Roman, Steven (2008), Advanced linear algebra (3rd ed. ), New York, NY: Springer Science + Business Media, LLC, ISBN 978-0-387-72828-5 . Shilov, Georgi E. (1977), Linear algebra (translated and edited by Richard A. Silverman ed. ), New York: Dover Publications, ISBN 0-486-63518-X . Demmel, James W. (1997), Applied numerical linear algebra, SIAM, ISBN 0-89871-389-7 . Lancaster, P. (1973), Matrix theory, Russian, Moscow, Russia: Science Publishers . Halmos, Paul R. (1987), Finite-dimensional vector spaces (8th ed. ), New York, NY: Springer-Verlag, ISBN 0387900934 . Pigolkina, T. S. and Shulman, V. S., Eigenvalue (in Russian), In:Vinogradov, I. M. (Ed. ), Mathematical Encyclopedia, Vol. 5, Soviet Encyclopedia, Moscow, 1977. Pigolkina, T. S. and Shulman, V. S., Eigenvector (in Russian), In:Vinogradov, I. M. (Ed. ), Mathematical Encyclopedia, Vol. 5, Soviet Encyclopedia, Moscow, 1977. Greub, Werner H. (1975), Linear Algebra (4th Edition), Springer-Verlag, New York, NY, ISBN 0-387-90110-8 . Larson, Ron; Edwards, Bruce H. (2003), Elementary linear algebra (5th ed. ), Houghton Mifflin Company, ISBN 0-618-33567-6 . Curtis, Charles W., Linear Algebra: An Introductory Approach, 347 p., Springer; 4th ed. 1984. Corr. 7th printing edition (August 19, 1999), ISBN 0387909923. Shores, Thomas S. (2007), Applied linear algebra and matrix analysis, Springer Science+Business Media, LLC, ISBN 0-387-33194-8 . Gohberg, Israel; Lancaster, Peter; Rodman, Leiba (2005), Indefinite linear algebra and applications, Basel-Boston-Berlin: Birkhäuser Verlag, ISBN 3-7643-7349-0 . I got what you mean, thanks for putting up. Woh I am gladsome to mature this website through google. Thanks For Share Eigenvalue, eigenvector and eigenspace – Lyudmil Antonov.